When York, Pa.'s Live — the toast of grunge rock with a spiritual lyrical bent — plays this weekend at Camden's BB&T Pavilion, it will mark the return of a band broken apart for seven years. The four old friends are making new music — "Love Lounge" is freshly released, with an EP's worth of tunes to follow in the fall. 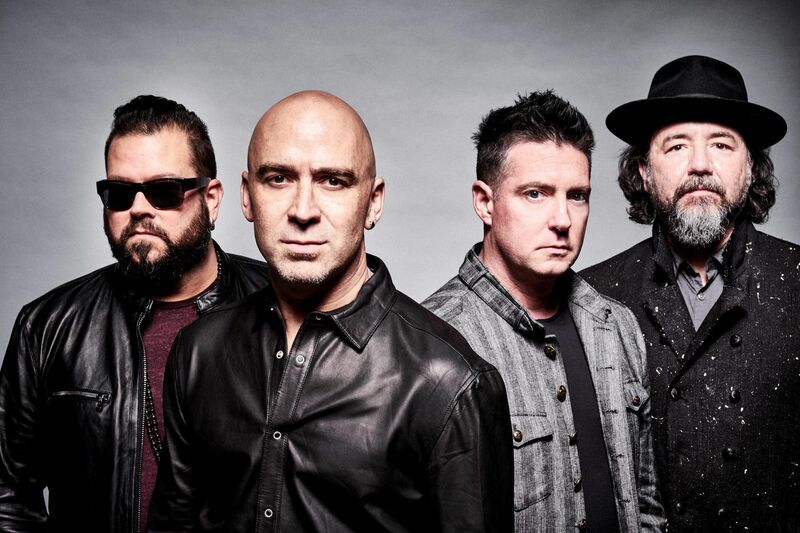 "Making new music was definitely a part of us getting back together," said Ed Kowalczyk, the throaty tenor vocalist-lyricist who left Live for a solo career in 2009 only to rejoin Chad Taylor, Patrick Dahlheimer, and Chad Gracey in 2016. "But as old friends from grade school days, making music — like just being together again — is second nature. It only took a few days from our first meeting to get back in the studio and start again." Guitarist Taylor added something poignant: "My concern wasn't about the band," he said. "I simply missed my childhood friend Ed. The fans cared about the band, and I understand this, but Ed, Chad [Gracey], and Patrick are my family. Even if we never made music, I was hopeful someday we'd have the strength to put the past behind us, which we did. The unexpected and joyful reunion of our quartet is simply the icing on the cake." Friends and collaborators since the early 1980s with band names such as First Aid and Body Odor Boys, the foursome became Live in 1991, hit the studio with producer Jerry Harrison, and recorded the Four Songs EP and their debut album, Mental Jewelry. "What united us as friends at 12, 13 years old was a shared love for music — and, thank god, the same kind, the same aesthetic, the same vibe," said Kowalczyk. "Oddly enough, too, we had a fairly complex and complete feeling about what we wanted to sound like." In Kowalczyk's eyes, Live was young but had a fully formed vision of itself intact, with lyrics based on his own spiritual quest for understanding. "When I met three guys who loved music as much as me, it felt like an oasis far from the pressures of normal teenage life," said Taylor. "I'm sure to older adults we were a bit of a freak show. To our peers, they couldn't understand our obsession with sound, instruments, and even the execution of performance. I mean, there was a collective sound that only the four of us could make. I recall falling in love with my guitar, as the instrument and its case had such a distinct smell. I practiced so much that I often slept with the guitar next to me in bed." Complex grunge-era guitar rock inspired by the mysticism of Indian philosopher Jiddu Krishnamurti is what gave Live its unique edge (and its rabid fan base) on such platinum-plated successes as 1994's Throwing Copper (which contained the hits "I Alone" and "Lightning Crashes"), 1997's Secret Samadhi, and 1999's The Distance to Here (containing "Dolphin's Cry"). Kowalczyk recalls the moment he believed Live found its fans — "fitting into that alternative sound of the moment, R.E.M., the Cure, Bauhaus, bands we had covered" — at a "ticketed gig at the Chameleon Club in Lancaster where we debuted our originals. The crowd and us totally connected." Live went on for 10 years of live LPs, greatest hits packages, and experimental recordings, but by 2009, the four friends needed space from one another. "That same passion and vibe we started with is here now, but it certainly had its ups and downs, a breakup that turned sour. Still, it was natural. We spent nearly every day of our lives since age 13 together … Luckily now, we're better than ever and on the same page, but things got weird for a minute," Kowalcyzk said. During that minute, Kowalczyk released two gospel-inspired solo albums that brought him back to the raw instinct of his start (2010's Alive, 2013's The Flood and the Mercy) while Taylor & Co. formed a new band, the Gracious Few, before redoing Live (without Ed). "I have nothing but fond memories of these songs and the band," Taylor says of his non-Kowalczyk output. As for the break, Taylor claims he had no clue "how good and positive the break would be for ourselves, and the music." Kowalczyk says the more he began missing his buds in the band, the more the quartet needed to hash things out. "About three years ago, after emails back and forth, we decided to meet for a beer," he said. "Forty-eight hours later, we jumped on the bike, and were playing together. None of us expected it would happen so fast, but it did. Then again, we had so many great decades — not just years — that there is a gratitude among the four us to be on stage as one again."